The most valuable company in the world kicked off its biggest event of the year with a celebrity singalong. 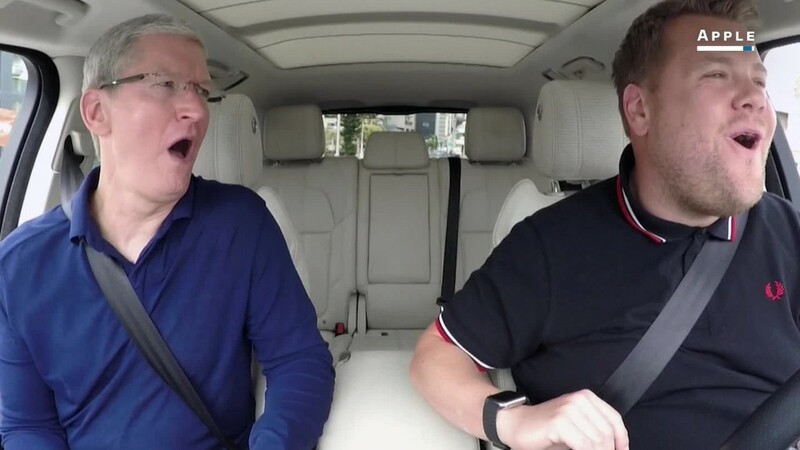 Before getting on stage to unveil the latest iPhone at Apple's big press event on Wednesday, CEO Tim Cook joined "Late Late Show" host James Corden for a special edition of his popular series Carpool Karaoke. Cook and Corden sang along in a car to the band One Republic, which Cook has previously called one of his favorite bands. They were joined by singer Pharrell Williams for a rousing rendition of Sweet Home Alabama by Lynyrd Skynyrd. The segment promoted a recent deal with CBS to offer the Carpool Karaoke series to Apple Music customers. The series' 16 episodes will be made available exclusively to Apple Music subscribers in a move that further expands the original content of the company's streaming music service. The karaoke bit was a lively, though unusual, introduction for Apple's high-stakes iPhone launch event. Even with the launch of products like the Apple Watch and iPad, the iPhone remains Apple's main moneymaker -- but sales for the device have declined in recent quarters, pushing the company's overall sales down with it. Apple (AAPL) will attempt to reverse that trend with the launch of the next generation iPhone, as well as a refreshed Apple Watch.